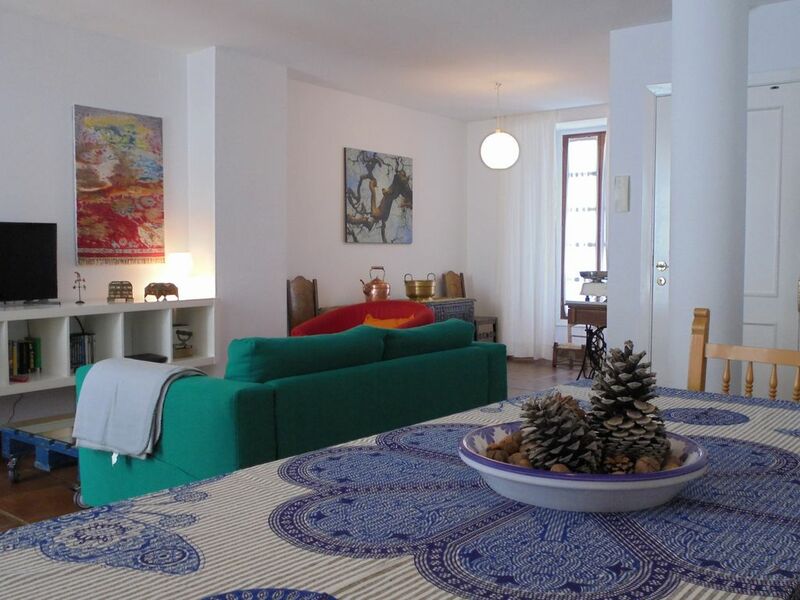 Beautiful and original apartment in the historical centre of the “Pueblo Blanco” village of Grazalema. Located on the ground floor and suitable for 2 pèople. It has a spacious living room and a well equipped kitchen, with everything you need, opening on to a little courtyard with a fish pond. The courtyard is connected to the courtyard of our art gallery but is private and a perfect place for breakfast. It has a double bedroom, and bathroom . The house is very comfortable , happy and quiet, cool in summer and suitable for winter days . It has tv, dvd free wifi, and a small library. Ideal for couples or creative people who need space and time. Grazalema is in a prime location within the Natural Park offering very diverse wildlife and unforgettable landscapes , it s a famed area for walking and bird watching. It has a population of 2000 people with interesting anthropologically fiestas such as The Bull Run and Flamenco festival, the historical reenactment of ' Los Bandoleros ' and of course good natural food, the award winning payoyo cheese being one of the best in Spain. There is the Pata Negra jamon form the local Iberian free range pigs and the wild meats such as partridge , venison , rabbit etc . Not to mention the oils and organic wines, almonds , pomegranates, oranges and many vegetables from nearby farms. In winter snow comes to Grazalema and is a big event with people coming from the nearby cities to contemplate the white beauty of its landscapes. The summer nights are perfect to appreciate the numerous terraces open until late at night. There are many places to swim and cool off, the swimming pool, Lakes, rivers and of cause the nearby coasts of Malaga and Cadiz. Grazalema is just 30kms from Ronda, monumental historical town and the area offers visits to Roman and Arabic ruins, Neolithic cave paintings and many wine bodegas and bars. Welcome Thank you for visiting our site. We are based in Grazalema, one of the prettiest villages at the heart of the parque natural "Sierra de Grazalema". The villages, mountains and valleys of the "Sierra de Grazalema" are incredibly beautiful, rich in both plant and animal life, with strong cultural links to both the Romans and the Moors. The area was declared by UNESCO in 1977 as a Biosphere Reserve, an area of world importance. Grazalema is an ideal base for both rural and village holidays and offers a wealth of different experiences from walking, horse riding, bird watching, swimming and fishing to a good selection of restaurants and bars or for just relaxing. It is also a great base to visit most of the main tourist sites in Andalucia, e.g. Cadiz, Seville Malaga, Algecira, the Costa del Sol and the Atlantic coast all of which are within a 2 hours drive away, and Granada and Cordoba which are within a 3 hour drive. A well equipped apartment convenient for the town centre and getting out into the countryside. Having twin beds instead of a double in one of the rooms would make it more flexible, e.g. for a family. Some night time noise from a nearby bakery noticeable in the back bedroom when the windows were open. Negotiating the narrow local streets and parking nearby can be a bit of a challenge but there are car parks on the edge of the village. We enjoyed our stay and would stay in the same apartment again. The apartment met our expectations in every respect and is particularly well situated for anyone wanting to explore the Grazalema area. We used it as a base for a walking holiday and would certainly recommend it to others. The owner was friendly and helped us to obtain access permits for the restricted area. Nice flat in townhouse in Grazalema. All you need for a good vacation knives, forks, cork screw, dish washer etc. and 2 good bedrooms. Very good accomodations for 2 pairs or a family up to 4. Close to restaurants, bars, shops etc. Dejlig autentisk lejlighed med nutidig comfort. Dog lidt kold i april måned. Muchas gracias por elegir nuestro apartamento. Estamos muy contentos de que hayáis tenido unas buenas vacaciones en Namaste. Gracias por apreciar el cariño y la dedicación que le ponemos a la casa y por cuidarla como nosotros.